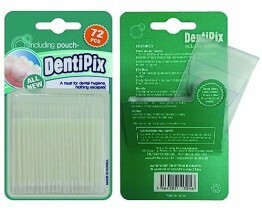 DentiPix is the world’s first and only patented invention for dental care. The filaments are made of nylon, just like general toothbrush products, for a gentle touch that will not damage teeth and gums, unlike conventional interdental brushes which are made of inferior wire or plastic forms. No more picking! It’s a brushing! 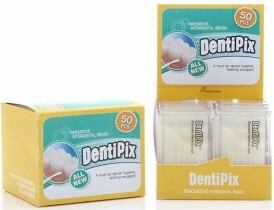 DentiPix is a mini toothbrush. 2) Fine nylon fibers smoothly penetrate into tight spaces between teeth, removing plaque, effectively cleaning up after meals, and leaving your mouth clean and refreshed. 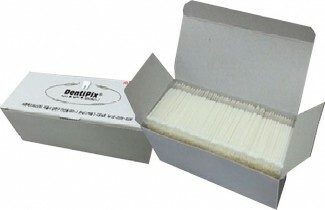 3) Each end of the DentiPix holds two different types of bristles, each with its own function. 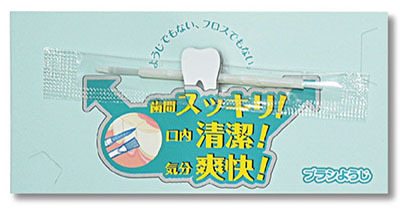 4) The cone-shaped tip cleans between teeth, while the flat tip on the opposite end removes plaque and massages gums. 5) The handle can be bent into any angle to easily care for hard-to-reach molars. 6) Disposable design effectively resolves potential sanitary problems caused by repeated use. 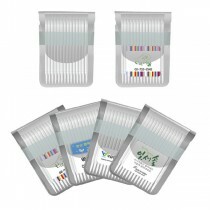 • Suitable for restaurants, food supplies, promotions, etc. • Individual opp pack for sanitary safety. • Bulk package for additional packing at customer’s side.